As we venture out into the world of customized reports, there are some limitations to keep in mind for best results and for your emotional well-being. Export more than 5000 rows of actual results. Keep in mind that you can continue to sort by Dimensions and measures. The most common types of reports that may exceed their row limit will be Dusty Inventory or Customer Lifetime Value. 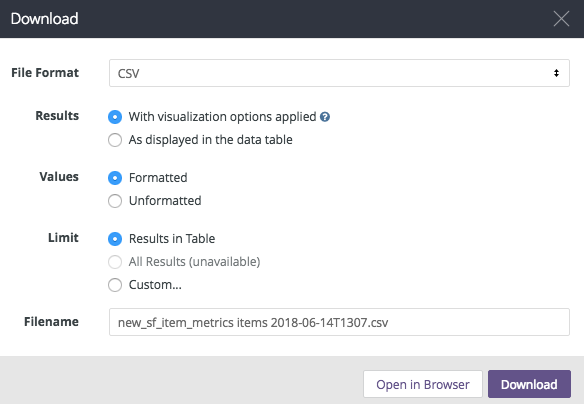 However, you can create calculations to show column or row totals, either explicitly as calculated fields of their own, or implicitly in complex calculations. There is a threshold to how much calculation a table can take before it doesn't launch any more. Currently, there is not an efficient way of illustrating when a report is too calculation-heavy, This is why, in the best practices, we recommend saving different versions of your report as the calculations become progressively more complex. In some calculations, Analytics does not like mixing types of values. This comes up a lot when dates are involved. In some spreadsheet values, dates are considered numbers. In Analytics they are not. To compensate for this, you can extract a number from a date and use it instead. Now, to get the sorting I want, I can create a calculation hidden from visualization that will do the custom sorting for me. If you're reporting on a dimension, and no data exists with that dimension on it, the value will not appear in your results.